Profile Builder has been tested and is fully compatible with two third party plugins that allow you to Import or Export users in WordPress. Until we finalize developing our built in Import / Export Users Add-on, we’ll be offering support for importing or exporting your users via these tools. So if you’re looking for an easy way to Import / Export users from/into a .CSV file feel free to use the step by step guide below. Before Importing or Exporting your Users please do a backup of your database. This will help you restore your database in case something will not work correctly. 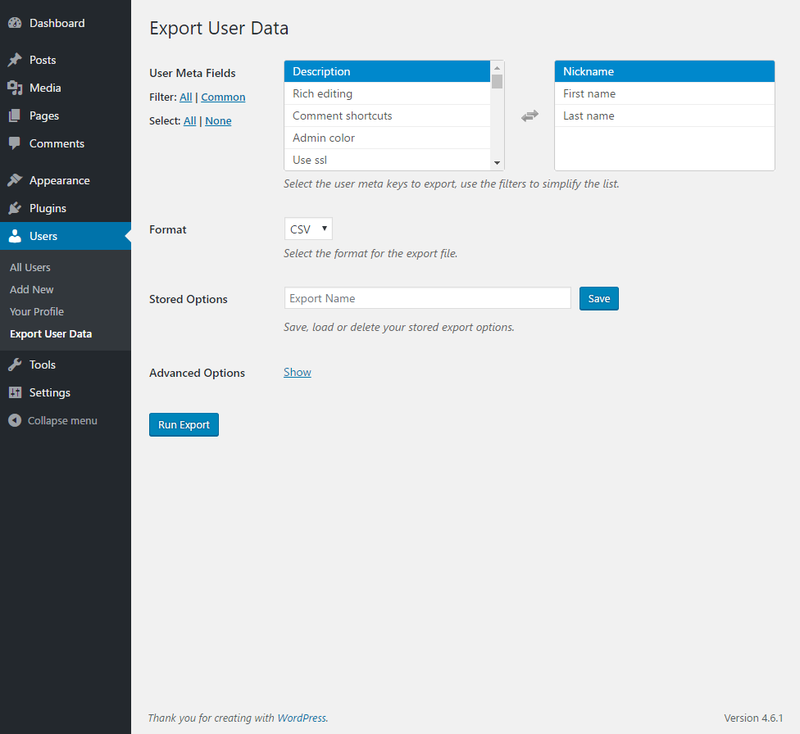 This way after the Import you will be able to Edit and Manage all the imported Extra Fields Types via Profile Builder. 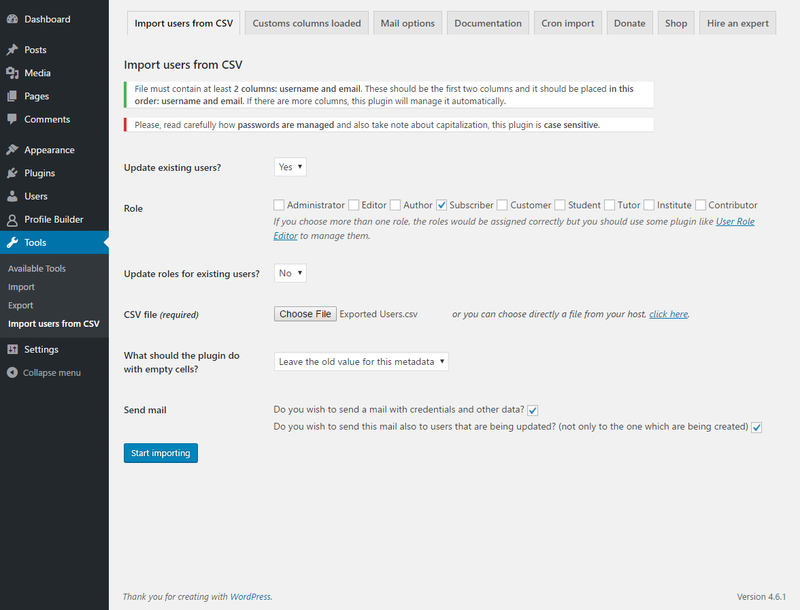 Choose if you want to update existing users, the role that new users will receive, if you want to update the role for existing users, your .CSV file, choose what should the plugin do with empty cells and also if you want to send emails, then click Start Importing. 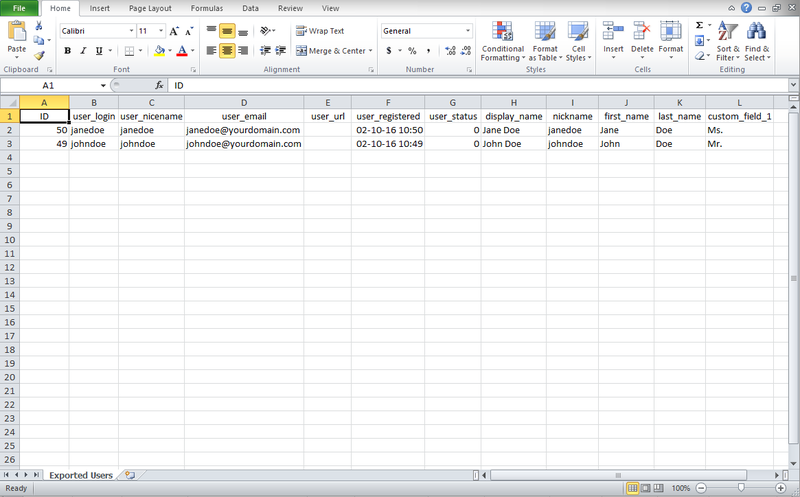 Each row in your .CSV file should represent a user; each column identifies user data or meta data. If a column name matches a field in the user table, data from this column is imported in that field; if not, data is imported in a user meta field with the name of the column. After importing, you will see the imported custom fields being displayed twice in the Back-end User Profile. You will need to disable the Import plugin for them to only be showed once and correct. You’ll be able to filter fields, select all fields or only some fields, set the format or even store your export options. In the Advance Options tab you will be able to select if you want to export standard user fields, if you want to export a specific user role or all the roles and also to export based on registration date, a limit range or based on updated since date. If you don’t want to add inside the exported file the default fields like user_login, user_nicename, user_email, user_url, user_registered, user_status, display_name go to Users -> Export User Data -> Advanced Options -> Show -> Uncheck “Standard User Fields”. Keep in mind that the ID will still be added inside the exported file. 3. Click Run Export and you’re done. Once you click the Run Export button, you’ll be prompted with a .CSV file containing all the user data and metadata selected including Extra Fields Types created and managed with Profile Builder.